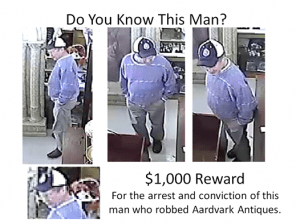 On the night of Sunday, March 9, Aardvark Antiques was robbed. More than $30,000 worth of jewelry was stolen. We held off announcing it because we had thought to keep it quiet, but is is obvious that it isn’t this guy’s first rodeo. He actually cased the store for about an hour the day prior to the burglary during which time he opened a back door so he’d have a way in when he came back. That night he returned masked and gloved and attempted to disable the security system by cutting some wires. Luckily, he cut the wrong wires and we have him on video the whole time we was robbing the store. Here, we have included some stills from the security video footage. We are offering a $1,000 reward for any information leading to the arrest and conviction of the man who did this. We are going public with this to prevent it from happening to anyone else. As for us, we’re installing a new security system that is top rated in the country. Click HERE to view the security camera footage.